Learning different ways to lobby for campus-impacting legislation was the focus for students and faculty from American River College that attended the Faculty Association of California Community Colleges (FACCC) annual advocacy and policy conference Sunday. ARC was represented by psychology professor Peg Scott, members of the Life is Worth the Walk club and ARC Student Senator Laurie Jones. The conference focused on teaching students and staff at California community colleges how to get involved with legislation impacting their campuses. The delegation from ARC focused on lobbying state senate and assembly members for support of Assembly Bill 2017, which would create funding streams for mental health services at institutions of higher education. The workshop featured faculty speakers from Butte College, El Camino College and Sacramento City College, and focused on student access to mental health professionals, student confidentiality and mandated reporting. 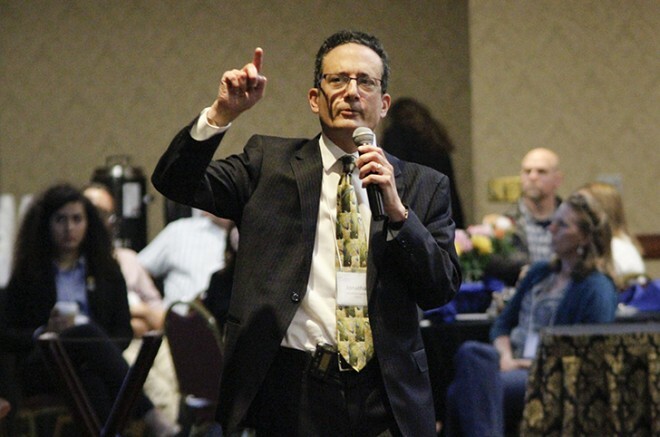 The conference also included a keynote speech from FACCC executive director Jonathan Lightman, who is beginning his seventeenth year with the organization. Lightman covered class structure in California, the impact of public higher education and the importance of advocacy in his speech. The conference’s general session drew lawmakers from both sides of the aisle to speak on issues at community colleges. Democratic California Assemblyman Kevin McCarty and Republican California Assemblyman Scott Wilk helped Lightman to outline future priorities for legislation and budgeting impacting the California community college system. “We are shortchanging our future by not investing in education…to continue being a global power, California needs to fund higher education.” said McCarty, who penned AB 2017. Wilk agreed and highlighted the problems in the primary and secondary education system that impact higher education. A large delegation of students from De Anza College in the San Jose area organized a student caucus, which allowed all the students in attendance to come together to collaborate across schools, sharing ideas about issues on their campuses and discussing future activism. The conference gave advocacy training to delegations from community colleges all over the state, teaching representatives how to lobby to their legislators and placing emphasis on the power of the community college system as compared to the CSU and UC system. Be the first to comment on "ARC representatives lobby for mental health services while attending legislative advocacy conference"